Synopsis: For a thousand yahren the war with the Cylons has lasted. 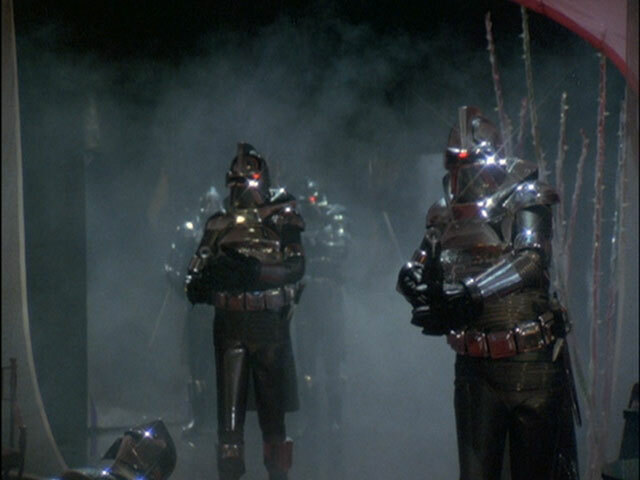 The Cylons are machines and their creators – the original race called “Cylons” – have died out long ago. 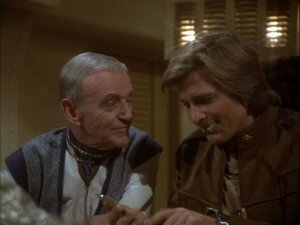 But now an armistice was negotiated by Baltar and the fleet of the Twelve Colonies of Man meets with the Cylons to sign a peace treaty. But Baltar has betrayed his own species to seize power and the Cylons launch a large-scale attack on the colonial fleets and the colonies. Only one Battlestar – the Galactica – and a few refugees survive that holocaust. But there’s a myth about a thirteenth colony of Kobol. 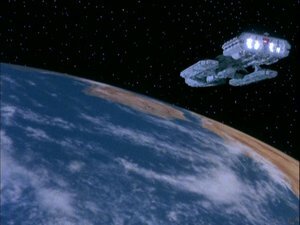 Commander Adama and his fleet of 220 ships leave the colonies behind to find that legendary colony: Earth. But it won’t be an easy journey and there are still those who believe that mankind should lay down its weapons and seek peace with the Cylons. My Opinion: The show begins with an epic three-parter which was re-cut and re-published as a movie. The designs of that show are still great. The Galactica, the Cylons (“walking chrome toasters”), the Cylon Raiders, the Basestars. Although the deception of mankind and the destruction of the fleet was a bit too easy, it was a decent start for the story and it showed that Adama is an astute commander and that he has the best pilots in the fleet. I also liked their sense of humour: One of the ships had an advertisement printed on the side: “Colonial Movers – We Move Anywhere”. The characters are also good. They may not have the depth of nowadays’s characters, but they have charm: Adama, Apollo, Starbuck, Athena, Cassiopeia, Serina, … and of course the diabolical Baltar. 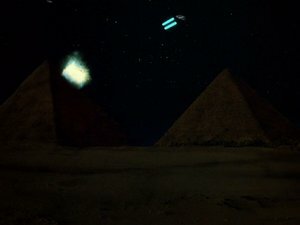 Synopsis: Starbuck and Apollo detect a vast electromagnetic void on one of their patrols. Once inside it, there are no more stars, no more anything. 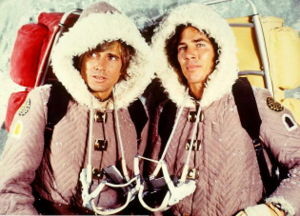 But Galactica hasn’t much choice because Jolly and Boomer have detected a cylon outpost on their patrol. And there’s another problem: Jolly and Boomer have brought some kind of disease with them and they have infected most of the fighter pilots during Apollo’s bachelor party. Now the shuttle pilots have to learn how to fly a Viper. Amongst them: Athena and Serina, Apollo’s fiancé. My Opinion: It sounds a bit harsh but it would have been more realistic if they had killed at least one of the cadets. They’re sitting in a Viper for the first time and yet they destroy an antire squadron of Cylon Raiders. But I really liked it that they made no (verbal) issue about them being woman, just rookies. But one could see that Starbuck and Apollo felt a bit uncomfortable because “things had changed”. Synopsis: Baltar – who has been given a Basestar of his own – has been following the fleet for some time now. When they enter the void and he realizes that Adama plans to find Kobol, the planet from which the thirteen tribes set out. He develops a plan to lure the fleet into a trap. But for this he has to face Adama personally. But Lucifer – Baltar’s cylon second-in-command – has plans of his own. Meanwhile Apollo and Serina have married and Adama has found Kobol. He hopes that it will help him finding Earth. My Opinion: Lucifer is cool! He and Baltar are the perfect couple. 😉 What I just complained about did happen in this episode: Serina was killed by a Cylon and Apollo has to raise Boxey alone. 🙁 But I liked Baltar’s scheme, because it remained unclear to everyone (including the viewer) who he was trying to betray. 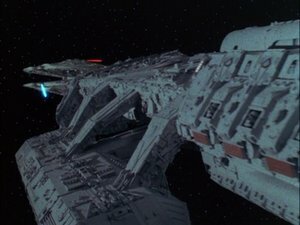 Synopsis: Apollo tries to lure a cylon patrol away from the fleet and he succeeds. But then he runs out of fuel and has to land on a nearby planet. 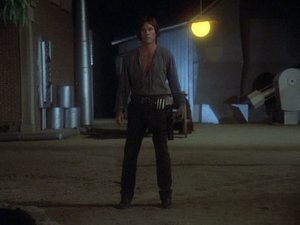 There he meets not only simple farmers but also a gangster and his henchman: Red Eye – a Cylon. My Opinion: It’s fascinating to see how many settlements lay between the twelve colonies and Earth (see following episode, too). Yet none of them seems aware of the war at all or hasn’t heard that it was lost. But I liked that a Centurion was allowed to play a main role. And he was a great gunslinger. I liked it how his scanner always stopped the moment he shot someone. I remember his death/destruction very vividly because my VCR always overdrove when it played that scene (It was to bright I believe). 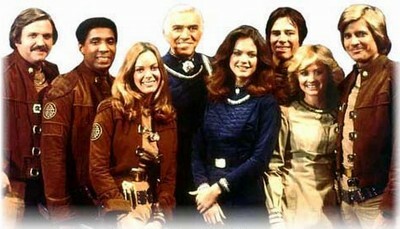 Synopsis: Galactica and the fleet have just past a dust cloud and entered a new galaxy. Starbuck is about to leave for a recon mission for which he will use a modified Viper: Doubled speed but no weapons. And a new computer system. But before he departs he has a double date: Starbuck with Cassiopeia and Starbuck with Athena. Unfortunately his luck doesn’t last and he gets lost in the new galaxy. My Opinion: I liked this episode a lot for different reasons. First of all because it symbolizes the charm of the old show. Starbuck dating two women at the same time. Grandpa Adama having his grandson on his lap and telling stories of Earth – on the bridge of a Battlestar. Starbuck finding a treasure in the form of Ambrosia (a beverage) that’s several hundred yahren old. But also the way they used astronomical terms (light speed, galaxy) without a care in the world. But I had forgotten that it was Starbuck who found the drawing of our solar system in a prison cell. In the re-imagined series Starbuck paints a picture of the “Eye of Jupiter” which will be later discovered to be a pointer towards Earth. 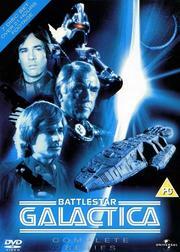 Synopsis: Baltar and his Basestar is driving the Galactica and the fleet forward. And of course he is driving them into a trap. 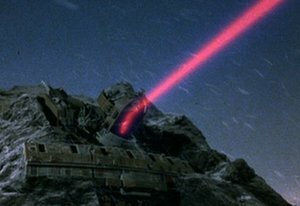 Starbuck and his patrol detect a Cylon-occupied planet on which a huge pulsar cannon is positioned. This gun could destroy a Battlestar with a single shot. 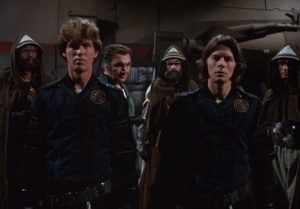 Starbuck, Boomer, Apollo and a group of demolition experts (read: criminals who like to blow things up) try to destroy it, but they get shot down and have to fight for their survival on an ice planet. My Opinion: Except for the cold it must be paradise for Starbuck: Countless nice women and they are all equally beautiful (because they all look the same 😉 ). I didn’t remember that the old fleet also had a prison ship. But it bothered me that Boxey could sneak in on the shuttle – that boy seems to be everywhere. And crash-landing (instead of just landing) also seems to be a recurring theme on the show. But I didn’t care much for this or the following episode. Synopsis: Having found help in the form of a group of Human clones the colonial fighters are still trying to destroy the pulsar cannon. But they are running out of time because the fleet is closing in on the shooting range of the cannon. If they fail the fleet will most likely not survive. My Opinion: An OK conclusion to the story (of course they destroyed the gun). But I liked how Baltar toyed with the fleet and made them do what he wanted. 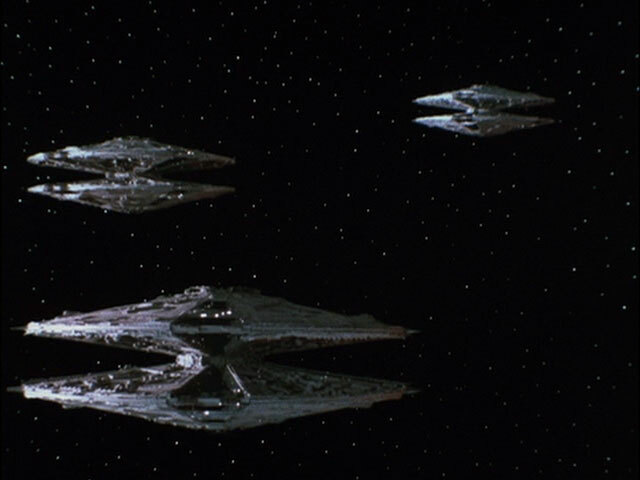 Synopsis: The Cylons have attacked the fleet and destroyed two of the agricultural ships and damaged another. The fleet needs new seeds and they hope they can trade for it on a nearby planet. Even Adama is coming along on this landing mission. But Boomer and Starbuck get robbed and have now nothing to trade. Fortunately for Starbuck the people there play cards, too. Unfortunately that brings him in even deeper trouble and in the middle of a fight between the local Humans and another alien race. My Opinion: A rather ridiculous story. The entire story about Adama and his “stalker” was absurd and the way Starbuck became the Constable was ludicrous. And on top of that all were these “pig aliens”. Synopsis: Starbuck gets shot down by a Cylon patrol and has to crash-land while Boomer returns to the fleet. Shortly after he got apprehended by a patrol of the local Cylon garrison he gets freed by local Human resistance fighter. But they are merely children, not warriors. Synopsis: “Commander, there’s a signal coming over Fleet Comm Line Alpha!” There’s another surviving Battlestar, the Pegasus, under the command of Commander Cain, a living legend. Now they have two Battlestars and Cain wants to use them to attack the outer capital of the Cylon Empire. But Adama can’t leave the fleet defenceless, he has to care for more than just revenge. 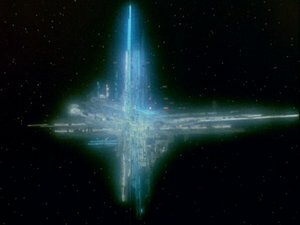 And Baltar has now the force of three Basestars and wants to wipe out the colonial fleet once and for all. My Opinion: Great start to a great two-parter. I always liked this Cain. At times he seems morally ambiguous but he has his heart at the right place and he takes a stand for what he believes is the right thing to do. 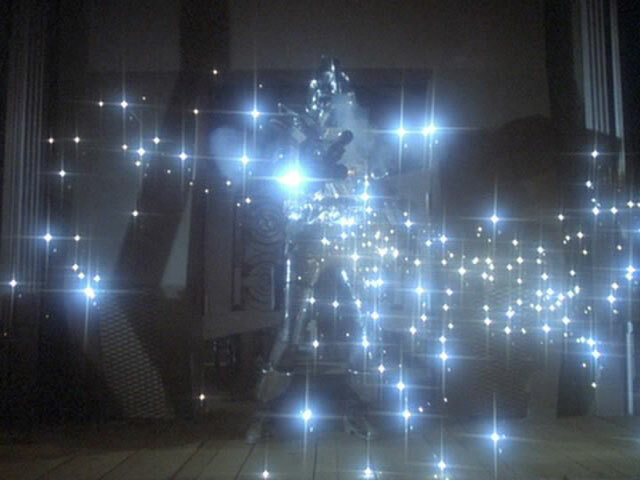 I also liked that they made some new special effects shot for this and the following episode, especially when it comes to shooting down Cylon Raiders. And I loved Baltar’s face when he saw that second Battlestar! 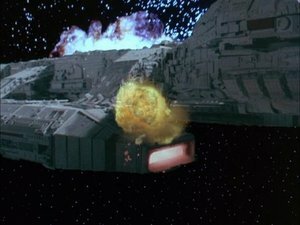 Synopsis: Thanks to the Pegasus Baltar’s attack failed miserably but the Galactica was heavily damaged. But the fleet is running out of fuel. They have to attack the Cylon capital and their fuel depots. 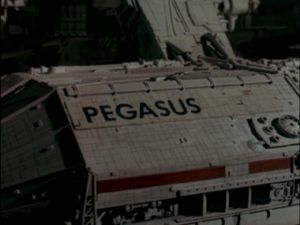 Cain devises a plan where the Pegasus diverts the Basestars and the Galactica attacks Gomorray and secures the fuel. One Battlestar against three Basestars. This will be a battle to be remembered. Synopsis: The Cylons have developed a new tactic. Instead of engaging the colonial Vipers in a dogfight and getting shot down they simply load their Raiders with explosives and ram the Galactica. And it’s working. The Galactica sustains heavy damages. 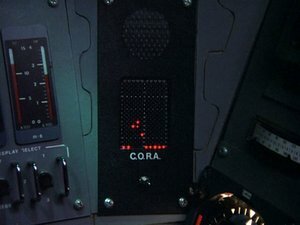 One landing pod is burning uncontrollably, Adama is badly hurt and needs surgery and Boxey, Athena, Boomer and others are caught between burning sections of the ship. Every attempt to extinguish the fires is failing until there’s only one solution left: To blow holes in the outer hull and let the vacuum of space do the job. My Opinion: This episode and the two previous ones were re-cut and released in european theatres as Mission Galactica: The Cylon Attack. I thought this was a good, dramatic episode that took its time to develop the characters a bit more – especially Boomer’s and the doctor’s character. I also liked Starbuck’s and Apollo’s “space walk”. It may not have looked perfect but I thought it looked fairly decent and not as if they were hanging on ropes or something. Synopsis: A patrol has gone lost when they were scouting a nearby sector. Suddenly there were bright lights and an eerie sound and they simply vanished. Starbuck, Apollo and Sheba (Cain’s daughter) land on a planet in that sector and discover a crashed ship – and what seems to be a survivor. He asks to be brought to the fleet and they agree. But once in the fleet he tries to become more: The fleet’s leader to Earth and he has very persuasive powers. He even promises them their arch enemy: Baltar. My Opinion: Patrick McNee played a great Iblis. He has the charisma and when he threatens someone he is deadly serious. It became clear very quickly what Iblis was supposed to be, but I enjoyed it nonetheless. 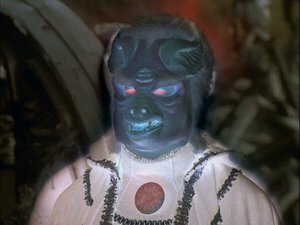 Synopsis: As promised, Baltar is now a prisoner in the fleet and Count Iblis gains more power every day. But since he has come aboard the spheres of bright light are always in and around the fleet and they seem connected to Iblis. Starbuck, Apollo and his father are amongst the few who don’t fall for Iblis’s charming personality. And Baltar has found out where he heard Iblis’s voice before: From the voice synthesizer of the Cylon Imperious Leader. My Opinion: Funny thing is that Patrick McNee actually voices the Imperious Leader. But luckily neither is Iblis the devil in the literal sense nor are these light beings angels. They are just older than the Humans. One could compare it to the First Ones in Babylon 5. I liked the conclusion that even these higher beings have to follow the rules and that not even Iblis can break them. But I have to say that I didn’t like Anne Lockhart’s (Sheba) acting in the “ship of light”. Her mourning didn’t convince me. Granted the acting in this entire show isn’t the best, but that scene stood out for me. Synopsis: When Starbuck tries a new gaming system that “can’t lose” an older man starts a conversation explaining to him why it won’t work. As it turns out this man, Chameleon, may very well be Starbucks long lost father and both men get really exited about the idea. But Apollo is a bit more sceptical, especially since a group of Borellian Nomen warriors also seem to have an interest in that old man. Is this for real or just a con to get protected by colonial warriors? My Opinion: I really liked Fred Astaire’s appearance in this episode. Even with the Borellians this was a nice change from the constant fight for survival. And it’s fitting that Starbuck’s father is a card player and a con man. Synopsis: Starbuck and Ortega have a long history of mutual dislike and every time they “meet” each other in a Triad ball game there’s bad blood between them. 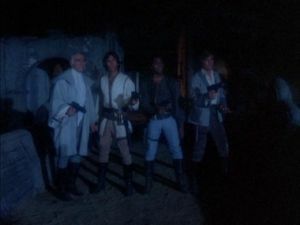 And when Ortega is found shot to death by a laser pistol Starbuck becomes the main suspect, especially since he was seen leaving the crime scene and his pistol isn’t fully charged anymore. But none of his friends would believe that Starbuck would kill someone and Apollo is going to be his defense attorney. My Opinion: Huh. Couldn’t even remember that episode. Apollo defends Starbuck in a court of law. Yet another detail they will re-use in the new series (though it won’t be Starbuck who needs defending). And I liked it how Apollo used Baltar as bait who in turn wasn’t too happy about that. 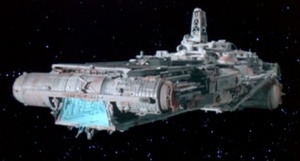 Synopsis: The Galactica intercepts a vessel in which six passengers are in stasis. And the ship uses technologies unlike any used in the colonies. But when these people awake they can’t breathe the dense atmosphere aboard the Galactica. Starbuck and Apollo are escorting them to their original destination in order to find out where they came from and if they know anything about Earth. But there’s a third party involved: The Eastern Alliance, the military force that rules this part of the galaxy. My Opinion: An episode of it’s era. The good west against the bad Eastern Alliance with typical uniforms and bad accents. I also didn’t really like these two androids, they were too cartoon-like for my taste. And the acting was again below average. It didn’t feel natural. Synopsis: Baltar, the Borellians and the soldiers of the Eastern Alliance plan to escape from the prison barge. And they succeed. 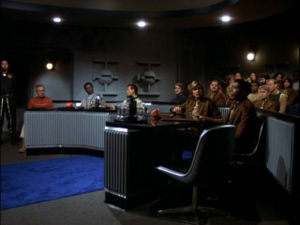 Aboard the Galactica they take the Quorum members as hostages (except for Adama and Siress Tinia). Adama has to either let them go or he has to try to free the Quorum members with the risk of getting them killed. My Opinion: I really liked the irony of this episode’s title and the fact that Baltar was the only one who didn’t escape. 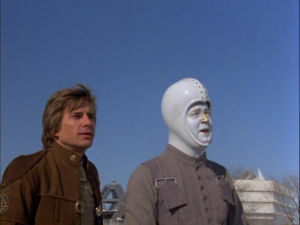 And the moment I saw the dismantled Cylons and Apollo stating that he had a plan I really believed (and hoped) that he and Starbuck would slip into the armour and pretend to be Cylon pilots. Too bad they didn’t make that move, that would have been fun. Synopsis: When the squadron is following the escaped prisoners to Lunar 7, Apollo is suddenly brought aboard the ship of light again. There he’s warned of a great danger Terra is in and that it’s important for them, for the people in the fleet and even for the light beings that he helps the people on Terra. When he lands there he’s recognized as someone else but he has little success in convincing them. Luckily Starbuck and also the Galactica aren’t that far behind. 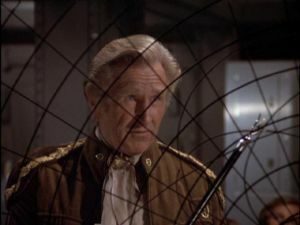 My Opinion: I really liked Edward Mulhare (Devon in Knight Rider) in the role of John. He was a funny guy and yet recognizable as the father figure he would later become to Michael Knight. But I also liked that Terra wasn’t Earth, I didn’t like the Terra storyline very much. Synopsis: During a ceremony Starbuck discovers that an old girlfriend of his is still alive and did not die on Caprica as he had suspected. Cassiopeia isn’t very thrilled but there’s also not much she can do. 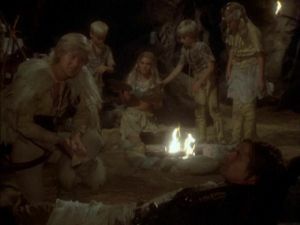 Starbuck and Apollo follow Aurora to the Celestra and run in the middle of a mutiny. And Aurora is of course among the mutineers. But not everything is as it appears to be. My Opinion: It was an OK episode. But it was a bit constructed that the XO developed the plan to get rid of his captain and miraculously a mutiny started in just that moment and gave him the opportunity. The captain also seemed to have lost touch with his crew, otherwise he had to notice that his XO was a “slave driver”. But he still got a medal for his excellent leadership. Synopsis: The Galactica receives a signal that might have come from Earth but soon they detect a hidden Basestar that is looking for them. But Adama and Tigh are both tired of running. 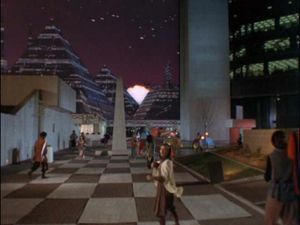 Adama develops a plan to attack and destroy the Basestar and its Raiders. Apollo and Starbuck get the most crucial role in that attack: They have to board the Basestar and to destroy its sensors. Both Cassiopeia and Sheba aren’t very happy about it. My Opinion: I really liked that final episode of the old series. It had the right amount (and quality) of humour and charm in it and also a good deal of action – even though they re-used the FX shots once again, there were so many and even some new shots that it looked really good. I also liked the idea that Apollo and Sheba may become a couple, Apollo had been alone since Serina died. The Series – My Opinion: I will miss these guys. I really like the new series. But it’s different there. The old series had its own charm and the characters are still great. Granted, a lot of the episodes have aged a lot and don’t hold up in comparison to today’s shows but it was still nice to see characters that aren’t burdened with a difficult past but are straightforward WYSIWYGs.